Chicken 65, one of the most popular Indian chicken starter recipes / easy starter recipes. There are many ways of making chicken 65 and all are totally different from one another in taste and texture. Some look crispy and some juicy while some looks both crispy and juicy. 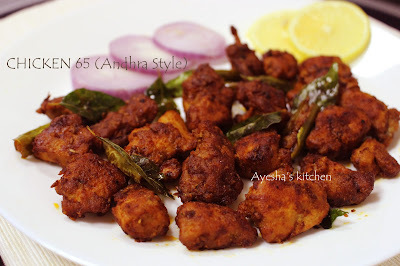 Here am going to share Andhra style / Hyderabadi style chicken 65 recipe which is worth serving as a starter recipe for special occasions or as yummy lunch ideas for parties. The recipe which I adopted from vahchef has never turned me down yet. As the use of FOOD COLOR IS UNHEALTHY, I skipped that ingredient in my recipe which is the main ingredient in most of the restaurants that give a reddish texture to the chicken chunks. I had already posted two types of chicken 65 recipe Restaurant style chicken 65 recipe and Chicken 65 recipe without egg and maida... Both are different in taste and texture. As I told earlier, there are lots and lots of varieties of chicken 65 recipe. 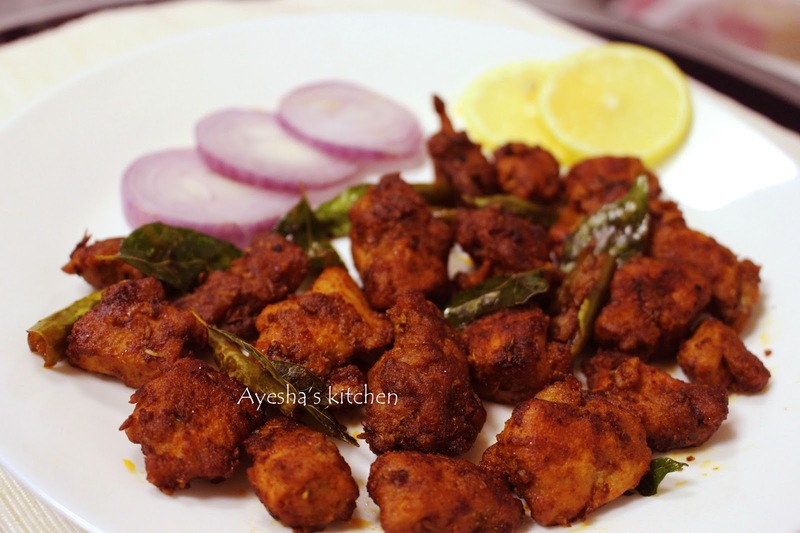 And here am sharing the recipe of Andhra style or Hyderabadi style chicken 65 recipes. The key to this recipe is sauteing the fried chicken in spiced yogurt mixture until the gravy is fully absorbed by the chicken chunks. So guys, try out this never fail easy chicken recipes...Hope you all will love this chicken recipe showing how to make Andhra style chicken 65 / how to make perfect chicken 65 / easy chicken breast recipes/. (you can also use a drop of red food color which gives a reddish texture to the dish. But I just skipped that and used Kashmiri chili powder only ). Marinate the chicken chunks with marinating ingredients and set aside for 1 hour or overnight. Now take corn flour and rice flour in a bowl and mix it with a little water to make a thick paste. Mix this mixture with the marinated chicken. Heat oil in a wok and when hot deep fry the chicken pieces until golden. Stir while frying for even frying. When done transfer to a tissue paper. Now heat a pan with 1 tbsp oil and fry the ingredients for tempering. When done add the tempering mixture which we set aside. When it starts bubbling, add the fried chicken to it and make the flame medium low. Toss the chicken well and let it absorbs all the moisture. Do not over fry or toss chicken which leads to hard chicken chunks. So off the flame when it looks juicy and crunchy.